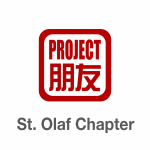 Project Pengyou St. Olaf Chapter is celebrating Pengyou Day by hosting an informal dinner discussion on campus. This will be a great opportunity for all old and new pengyou in the chapter to meet each other! We will also be sharing study-abroad and work experiences in China. Hope to see you there!